In my last blog post (Thoughts on the EU Referendum) I quickly skated over some of the immigration issues and was accused by some of not doing justice to the arguments. So let's look a little deeper. I should start by being clear that my direct personal experience of EU migration has been overwhelmingly positive. As an employer I see the positive side of immigration: young productive people who come here to work, earn money, pay taxes and - in many cases - ultimately return home. The EU migrants that I see couldn't be further from the benefits tourists of tabloid mythology. I'm well aware that I'm not somebody who is ever likely to perceive myself as competing with migrants for a job and I live in an area that nobody could describe as being "over-run with migrants". Both morally and practically I'm broadly in favour of migration and my personal circumstances are such that that's a reasonably easy position to adopt. The point I'm making here is that I'm aware that I risk being guilty of confirmation bias, of seeking evidence that supports my preconceptions. So with that potential bias declared, let's look at some practical realities. First of all we should be clear that the refugee crisis has nothing to do with our EU membership. The UK was able to opt-out of the Schengen free travel area, so we have border controls and passport checks on immigrants coming from EU countries. That’s why there are refugee camps in Calais; the nature of the UK’s membership of the EU is such that we can prevent non-EU migrants from moving to the UK. Remain or Leave makes no difference to that - it won't stop there being asylum seekers desperate to reach the UK and it won't stop us being able to refuse them entry if that's what we choose. Secondly a vote for Leave is not necessarily a vote to put a brake on EU migration. Both Switzerland and Norway – who are outside the EU – have far higher levels of EU migration (as a proportion of their populations) than the UK. They comply with the EU’s free movement rules, presumably because they consider this a price worth paying for free trade agreements with the EU. 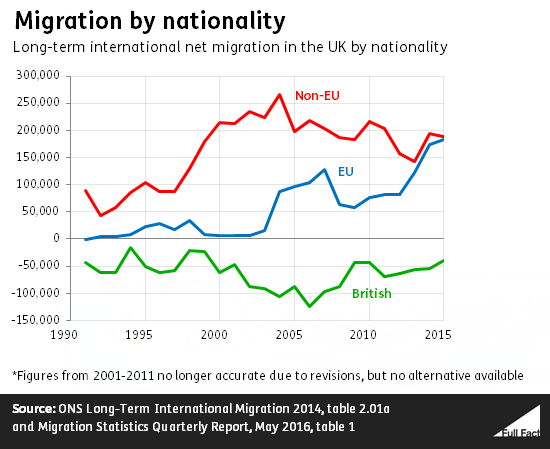 Thirdly - as covered thoroughly by Full Fact - despite the growth in EU migration in recent years, the majority of migration to the UK still (just) comes from outside the EU. The EU doesn’t stop us addressing non-EU migration, that is fully within our control. Which brings me to the final point: the net economic impact of migration. We’re living longer which means there’s upwards pressure on age-related spending such as pensions, healthcare and social care costs. Migrants tend to be younger people of working age who consume goods and services, pay their taxes and are net contributors to the UK’s public finances. Migrants from the EU are far more likely to have a job or be seeking work than those from outside the EU, so are of the "more likely to contribute" kind. That's the logic, but what about the research to back it up? I've tried to avoid my own confirmation bias and done a trawl of available research which I summarise below (with links to the full reports in case you want to check if I've been selective with my quotes). The bottom line is that there seems to be unanimity that EU migration specifically (as opposed to immigration overall which includes less economically productive non-EU migrants) is net positive to the UK's public finances. That's not to say that the freedom to fully control our immigration policies with respect to EU countries might not allow us to make immigration even more beneficial to us, but it shows up the argument that EU migrants damage the UK economy to be the populist nonsense that it is. "immigration from the EU is good for the public finances. Young people in work contribute, on average, much more in taxes than they take out in benefits and public service spending. [...] Without high net immigration the public finances would be in a worse state. If we were significantly to reduce the number of EU migrants, we would have to borrow more, raise taxes or spend less." "Our findings indicate that, when considering the resident immigrant population in each year from 1995 to 2011, immigrants from the European Economic Area (EEA) have made a positive fiscal contribution, even during periods when the UK was running budget deficits, while Non-EEA immigrants, not dissimilar to natives, have made a negative contribution. For immigrants that arrived since 2000, contributions have been positive throughout, and particularly so for immigrants from EEA countries. Notable is the strong positive contribution made by immigrants from countries that joined the EU in 2004." "EU immigrants pay more in taxes than they take out in welfare and the use of public services. They therefore help reduce the budget deficit. Immigrants do not have a negative effect on local services such as crime, education, health, or social housing"
"The migration scenarios illustrate that migration reduces upward pressure on debt over our 50-year projection period"
"European immigrants to the UK have paid more in taxes than they received in benefits, helping to relieve the fiscal burden on UK-born workers and contributing to the financing of public services"
"The IPPR is clear in saying that free movement within the European Union brings great benefits to all of its member states, including the UK." "Immigrants are thus neither a burden to the public purse nor are they a panacea for addressing fiscal challenges. In most countries, except in those with a large share of older migrants, migrants contribute more in taxes and social contributions than they receive in individual benefits." "there is evidence that EU migration has net fiscal benefits for the UK, and these might counterbalance any positive fiscal impact from repatriating the UK’s net contributions to the EU.26 At the same time, it is at least conceivable that if the freedom to set migration policy were used optimally, then this might have some positive impact on productivity." "... if post-Brexit the UK chose to adopt a restrictive migration policy - that if it chose to use the newly won flexibility afforded by Brexit to significantly reduce migration – that this would significantly damage the UK economy. However, if the UK adopted a relatively liberal policy – that is if we allowed a substantial increase in non-EU migration to partly counterbalance any reduction in EU migration – that any negative impacts would be mostly mitigated and indeed, if sufficiently liberal, there would even be economic gains"
"The evidence suggests that the fiscal impact of migration in the UK is small (less than +/-1% of GDP) and differs by migrant group (e.g. EEA migrants vs non-EEA migrants, recent migrants vs all migrants)." negative contributions by immigrants from the EU A10 group of countries and countries outside the EEA outweighing a positive contribution by immigrants from the EU15/other EEA countries [...] Estimates for the whole immigrant population residing in the UK in the fiscal year to end-March 2015 are that immigrants from EEA countries made a negative contribution of £1.2 billion in the year while those from non-EEA countries made a negative contribution of £15.6 billion, compared to an overall negative fiscal contribution by the UK-born population of £88 billion. It's worth looking at the Migration watch figures a little more closely as it stand out as being the only analysis to suggest a negative contribution for EEA countries (i.e EU + Iceland, Liechtenstein & Norway). where these expenditures will not vary directly in proportion to the size of the population, a different approach is to say that the cost to be allocated to migrants should be reduced to take account of the fact that the increase in population resulting from migration does not increase these costs to the same extent. This is the marginal cost method. They say "different", I say "better". 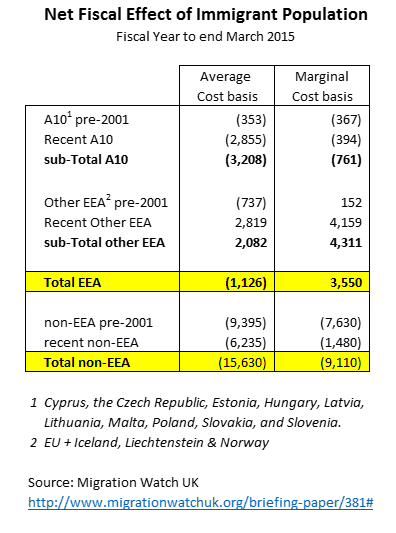 Below is a table summarising Migration Watch's own analysis on both a marginal and average cost basis and - lo and behold - on this more meaningful basis even Migration Watch show EEA Immigrants making a net positive fiscal contribution. EU migration is not one of the causes of the economic challenges we face, it’s one of the solutions to them. The EU ties us into conventions that are out of date and treat economic migrants coming from Turkey as refugees. What matters is not the size of workforce but productivity. Dunno if you havent noticed but we have machines that feed is and clothe us. We dont need 65m people especially with driverless cars on the horizon. Eastern Europeans send money abroad so a Pole who gets paid 8 pound an hr is not contributing the same as a UK born citizen. Never mind eh. Go back to playing golf in your countryside mansion mi lord. Switzerland does not comply with free movement rules. They voted in 2014 to reintroducing immigration quotas. It can be misleading to evaluate based on averages. Are high levels of immigration fair on low-skilled workers? "Swiss voted to introduce quotas on EU migrants from 2017. Such quotas would violate the terms of Switzerland’s free movement treaty with the EU. In fact, the EU has so far refused to agree to Swiss quotas for EU migrants and has threatened to suspend other EU-Swiss bilateral agreements with the country if Switzerland unilaterally imposes quotas"
1 / Migrants coming here to do the so called work we Brits won't , don't pay tax as the tax threshold and there earnings don't require it and are likely getting tax credits , child tax credits and child benefit , housing benefit etc ! to the tune of £5 billion a year ! 2 / The refugees within a year are naturalised in Germany and given EU passports some 280,000 or so a year, this is replicated in other EU countries ! Germany (288,800 asylum applications Jan-Sept 2015) , this guarantees free movement to the UK ! 4 / Around 5 million granted EU citizenship in last five years with 1.5 million coming to Britain ! 5 / Notwithstanding we have so called people who represent us not answering you when asked are they comfortable with the EU imposing a 5% vat on the poorest in Britain's energy bills ? Never mind the Tampon tax ! 6 / The more of the migration Sturgeon can get and exploit will ensure the type of people do thankful it will gain her dream of independence ! 7 / Last year the VAT exemption rate was removed for small businesses due to a change in EU rules with VAT now being paid by order of the EU ,plus our direct VAT to the EU is about �2 billion a year! 8 / Believing reports from the same people who warned of the dangers of leaving the ERM or glorified the case for joining the Euro should be taken with a pinch of salt , plus many of the institutions are sponsored and funded just like the remain campaign by the likes of Goldman Sachs ! 9 / Nippy can't argue and warn about the loss of £17 billion in Trade and 200,000 jobs with the EU , then argue differently for the £60 + billion in trade and 1 million + jobs with the UK. Conclusion I already voted Leave ! 1 / Migrants coming here to do the so called work we Brits won't , don't pay tax and are getting tax credits , child tax credits and child benefit , housing benefit etc ! to the tune of £5 billion a year ! 6 / The more of the migration Sturgeon can bring and manipulate will ensure the numbers to gain her dream of independence ! 7 / Last year the VAT exemption rate was removed for small businesses due to a change in EU rules with VAT now being paid by order of the EU ,plus our direct VAT to the EU is about £2 billion a year! This is true which is why when we leave we work together. Perhaps even with Russia. Lets see what happens when Russia and Norway cut gas exports in the winter. Lets see how negotiations go in a frosty winter. Thank you for the excellent article. I will quote you on baldwinfacts.blogspot.com. You write that your examination of some of the literature on migration “shows up the argument that EU migrants damage the UK economy to be the populist nonsense that it is”. I’m afraid this is an Aunt Sally. I must mix in the wrong circles, because I’ve never heard anyone say migration damages the economy. The argument is rather that, whatever the beneficial effects might be generally, migration harms the poor and the unemployed (many of whom are children and grandchildren of former Commonwealth migrants), and that it puts an unacceptable strain on public services. It isn’t enough to look only at the tax migrants pay versus the cost of the services they consume. You also have to look at the cost of looking after the people migrants displace from the labour market. Yet your post on migration doesn’t mention this anywhere. Why not? And two of the quotes you rely on make it clear the studies haven’t considered it either. We’ve talked a lot about confirmation bias. The people who end up working for institutions like the OECD or the LSE are the kind of people who are pro-migration. I guess we shouldn’t be too surprised when they don’t take into account the factors which might make it look as if migration had a downside. To be clear, migration undoubtedly helps the economy in that it helps keep wages down, wage inflation down and therefore inflation and interest rates down. So the economy can run faster. That’s fine unless you’re one of the people on low wages or who are jobless. Take a look at UK GDP data. Despite the post-2007 setback it has carried on its upward trend. But GDP per capita has faltered since the Great Migration began in 2004. In other words the UK’s output is not going up as quickly as its population. To put it another way – and this is the question I’d really like to Portes to answer – if every 100 migrants create more than 100 jobs, why do we still have any unemployed? After all, since 2004 the UK has taken on approx 2m migrants. If each created more than one job, two things would have happened. One, wages would have gone through the roof as employers competed for staff. Two, unemployment would have fallen to close to zero. But actually the reverse has happened. Unemployment is still at the same level it was in 2004, and real wages have stagnated. EU membership does not benefit all. Those it benefits most are the most affluent. Those it harms are amongst our poorest. That’s a shame in all senses of the word. You are correct, they do not start until 2017. For business and the economy overall high immigration is obviously a good thing. But for the general population is this true, or is it accelerating the polarisation of wealth? Are we building enough houses, school places etc for this net inflow? Any stats on this would be very interesting. The referendum discussion so far in the media has been very limited. Alan Parker: what you've done there is list a series of isolated figures and assertions and ignored what happens when you add it all up. A couple Express and Telegraph headlines (that fail to take the wider impact of migration into account) don't persuade me when people who've done thorough analysis draw a different conclusion. The Institute or Fiscal Studies (IFS), Royal Economic Society, London School of Economics (LSE), Office for Budget Responsibility (OBR), University College London (UCL), Institute for Public Policy Research (IPPR), Organisation for Economic Co-operation & Development (OECD), National Institute of Economic & Social Research (NIESR). Even, if you look closely at the figures, the anti-mass immigration body Migration Watch. Nicholas - if you think its an Aunt Sally I direct you to Alan Parker's comment above. As for your more detailed points: even Migration Watch (expressly anti-mass immigration) agree on the net fiscal benefit of EU immigration - strains on public services are considered in many of these reports - you seem to have not noticed that UK eemployment rate is at a 10 year low - you completely fail to recognise that *if* immigration is the problem you say it is, it's got a lot more to do with non-EU migration than that from the EU. I think anybody reading your comment can sense where your own confirmation bias is coming from. Need to forgive me Kevin PC is acting up and my mouse has a mind of its own and clicking and posting when it is not meant to ! Sir I doubt figures obtained by the publications I listed who quote the respected eurostat figures and from official sources are assertions , plus the evidence provided and link from the federal Ministry of the Interior in Germany clearly showing 288,000 naturalised migrants last year and who can now apply for an EU passport and move to the UK !
" Since 2010 over half of jobs created in the UK economy have been taken by immigrants. On the impact of immigration on average wage levels, the evidence is varied, but there is broad agreement that immigration has harmed the earnings of the most poorly-paid UK-born members of the labour force as well as those in the semi-unskilled service sector.Immigration has been a fiscal cost to the UK Exchequer. Between 1995 and 2011 migrants in the UK were a fiscal cost totalling £160 billion, or over £9 billion a year." " In a DWP report, specifically focusing on the employment impact on UK workers of skilled migrants, the MAC concluded that overall negative impacts were unlikely but it did importantly conclude that there was “repeated anecdotal evidence” of “negative effects” being experienced by UK – born individuals at the local level and in certain occupations, specifically IT "
There is sir a severe problem for over a decade now in UK unskilled and semi-skilled losing out in both the jobs market and the the wage market , which suits those supporting remain as it keeps profits up and costs down and it will only get worse ! The Government can't claim the million + in migrants coming here allegedly doing the jobs we won't are paying tax and paying there way , by definition they do not earn enough due to a generous tax threshold , and a benefit system that allows them to claim tax credits , child tax credits , child benefit , housing benefit etc etc . Notwithstanding the strain on Public service and the NHS especially . If as I surmise they are not paying in then the UK tax take is not rising and neither is the funding to cope in areas of public service and the NHS especially ! Alan, my dear fellow - calm down, you are ranting incoherently and haven't been paying attention. That migration watch quote? Its all immigrants not EU-immigrants and I cover the their analysis (and flawed "average cost") methodology in the blog - even *they* show EU migrants making a positive contribution. You're trying to use a "statistically insignificant" observation and "anecdotal evidence" as support for your argument - and continue to fail to differentiate between all and EU migration (we are only voting about our possible controls on the later). "you seem to have not noticed that UK employment rate is at a 10 year low"
Let's ignore the sneery "you seem not to have noticed". I say migration is causing unemployment to be higher than it otherwise would be. The fact that at last it is marginally lower than it was in about 2005 is absolutely irrelevant to that assertion. I think you probably know this. Another way of looking at is to say we haven’t succeeded in getting joblessness down from its 2005 level. That’s nothing to be proud of. "you completely fail to recognise that *if* immigration is the problem you say it is, it's got a lot more to do with non-EU migration than that from the EU". You're trying to have it both ways. You can't say "it's not a problem" as well as saying "anyway it's non-EU migrants' fault". That's a poor piece of logic. Anyway the figures don't bear out your assertion. According to David Goodhart's book, The British Dream, non-EU migrants are a lot less successful in finding work (only 35% in the case of Bangladeshis) than EU migrants (the overwhelming majority of whom are successful). The ONS figures you quote yourself make it clear that 75% of EU migrants come to work, whereas the figure for non-EU migrants is about 30%. So non-EU migrants are more likely to be a drain on the state, but, in case you hadn't noticed, this isn't my contention. It is that EU migrants keep British people (many of whom have black and brown faces) on low pay or on the dole. I notice you set great store by the Migrationwatch report. You much prefer their marginal cost method, which, conveniently for your argument, only counts state spending if it has to increase by the mere fact of the migrants’ presence. Yet even Migrationwatch don’t include in their calculation the cost of keeping British people on the dole, where natives are displaced from the labour market by migration. Even Migrationwatch don’t really help your case. "I think anybody reading your comment can sense where your own confirmation bias is coming from." I would absolutely concede that no-one is free from bias, however hard they strive to avoid it. You seem happy to acknowledge this regarding yourself. Why not then accept it might have been a factor in the studies you quote? As far as I can see these do not include the cost of keeping Brits on the dole. I wonder why not? Isn’t the reality that when economists say “Remain will make us better off” they are failing to invite the public to consider who is meant by “us”? For while I have no doubt the EU makes some people better off, those tend to be people like me and you rather than the unemployed or low paid. There’s no use saying, GDP will go up quicker if we Remain, when that doesn’t mean GDP per capita, or when the benefits from a faster rate of increase don’t spread equally across society. There’s no use saying, migrants pay their way in Britain if you don’t take into account the cost of looking after the people they dislodge from the labour market. There’s no use saying, look at all the jobs we’ve created inside the EU when actually about half those jobs have gone to people born outside the UK. 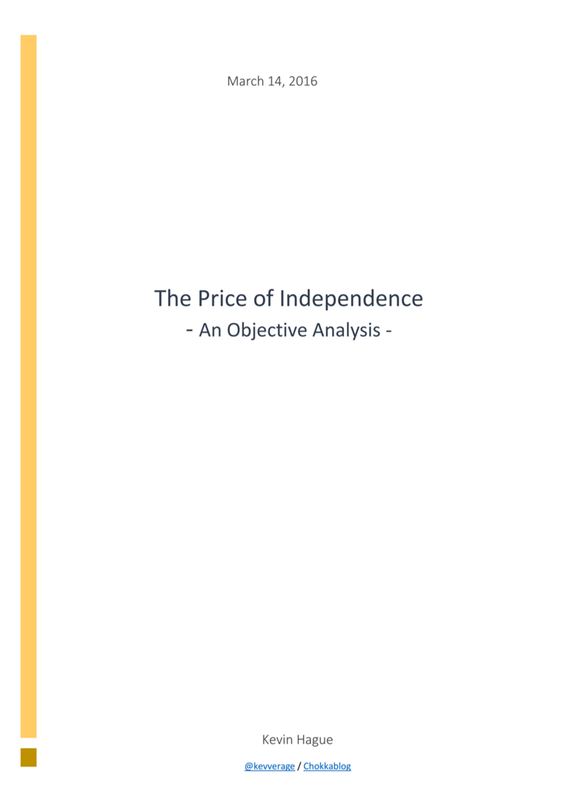 For a couple of years now I’ve been a great admirer of your work on the economic consequences of Independence. I think you made a real difference in helping people to understand what those consequences might be. You did this because you got a reputation for being scrupulously even-handed in your willingness to look not just at the facts which helped your case, but all the facts. And you never lost your cool in print. I think it’s worth bearing all that in mind when you write about the EU. Don’t become just another blogger. "The refugees within a year are naturalised in Germany and given EU passports"
This is not true at all - I know someone in Germany in the legal field who works with refugees. It takes 7 to 8 years of residence to be naturalised in Germany and requires the applicant to demonstrate sufficient language knowledge amongst other things. The link you posted yourself even says this, so why did you say "The refugees within a year are naturalised in Germany and given EU passports" - completely untrue! Refugees are initially given 3 years temporary leave to remain if their claim for asylum is accepted. This means that they must return to their country of origin after that period if the circumstance which caused them to apply for asylum have changed.no longer apply. Please stop getting your information from the Daily Express, which is notoriously anti immigration and frequently inaccurate - see the various IPSO complaints upheld against them. One other point Kevin. You're very keen to use the Migrationwatch figures on the marginal cost basis because they include only costs which are actually increased by the presence of migrants. Why then aren't you interested in counting the cost of keeping on benefits Brits displaced from the labour market? After all, these are costs which are caused by the presence of migrants, aren't they? I think you can't have it both ways. If you prefer the marginal cost basis by reason of its only counting actual costs to the UK, you've got to factor in the cost of keeping Brits on the dole. But nowhere in your last three posts do you mention this at all. Why? By the way, when you write that anyone can see where my "confirmation bias is coming from", do you mean I'm biased because I'm a racist xenophobe? If so, don't be coy. It would be good to know. Then perhaps we could discuss the evidential basis for your assertion. unemployment rate is at a 10 year low - even on the fully allocated basis MW struggle to make EU immigrants show as a net cost (including their ridiculous business taxes assumption) - your desperation to show these bloody migrants being the problem is indeed telling - maybe you should ask yourself why you leap on the least-favourable of all the analyses and try to make that one stick despite its demonstrated flaws? According to migration watch figures, net EU immigration for the last 25 years taking everything into account is roughly 1 million, not something worth losing sleep over. As for bringing down the average wage for poorer workers, isn't that the fault of the minimum wage level?